So You Don't Like Governor Perry? Take a Close Look at the Unacceptable Alternative! 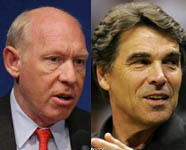 Non-Perry fans had better seriously consider what the possible election of Bill White can do to our state. The most important issues facing the next legislative session will be Re-districting which will determine the number of new Texas Congressional seats; dealing with the Budget shortfall without raising taxes; challenging Obamacare and other far left policies as they affect Texans; and Illegal immigration. A vote for Perry is a vote against liberal Bill White and a vote against his liberal tax and spend philosophy. Bill White refuses to rule out raising taxes. Bill White supports cap and trade. Bill White supports sanctuary city policies. Bill White supports gay marriage. Bill White is fine with national education standards. Bill White supported the $700 billion Wall Street bailout and the Obama stimulus. Bill White opposes Voter ID. Bill White supports restricting voting rights for military men and women. Bill White supports the EPA's powergrab of Texas' permitting process. Bill White opposes lawsuit reform.